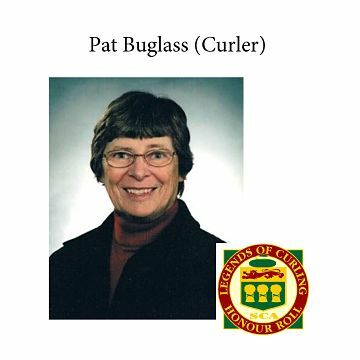 Pat Buglass began her curling career in Indian Head when she was in Grade 9. In 1959 her High School Team qualified for the Provincial High School Championship which was held in Moose Jaw. This was her first experience curling on artificial ice and in her words “they were happy to finish in the middle of the pack”. While in Grade 12 their team, with special consideration, were allowed to play in the Ladies Bonspiel. During that bonspiel there was a spring thaw which required the last game to be played at six in the morning before the heat of the day. The ice was still so heavy that only four out of the eight curlers were able to get the rocks over the hog line. Sharon Fyke asked Pat to play lead for her team of Lee Morrison and Vera Pezer for the 1964-65 Season. That year they qualified out of the Hub City Curling Club and qualified to play in the Northern Playdowns. They lost in the final to Barb McNiven of Delisle who went on to win the Provincial Championship. In 1974 Pat skipped her team of Marg Ravis, Marion Taylor and Joanne Risling to the Provincial Women’s Championship. They lost the final to Emily Farnham. In 1991 Pat qualified for the Senior Playdowns and began curling third with Emily Farnham, Marilynne Earl and Lori Harvie. They curled together until 1995, qualifying for the Provincial Championship every year. In 1993 they also qualified for the Northern Ladies Championship where they lost the C Final. In 1994 they won the Provincial Senior Women’s Championship and Pat was awarded the Ev Krahn Award. They went on to compete at the Canadian Championship in Moose Jaw. 1994 was a special year for Pat as she was also a member of the Provincial Senior Ladies Golf Team. In 1999 Skipping a team with Sharon Fyke, Gay Mudrie and Lorie Harvie, Pat won her second Provincial Senior Championship. That year the Canadian Championship was played at the Nutana Curling Club where they finished third and Pat was named to the Second All Star Team. In 2002 Pat began curling in the Masters Playdowns. From 2002 to 2009 they were Provincial Runner up four times and won the Championship in 2005 with Sharon Fyke, Rhoda Besse and Lori Harvie. At the Canadian Championship held in Brandon, Manitoba they finished 2nd. The start of her competitive curling career also marked the start of her career as a volunteer. She began with becoming a member of the Saskatoon Ladies Bonspiel Committee, served as President of the Granite Evening Ladies Curling Club and was on the Board of Directors of the Granite Curling Club. From 1986 to 1989 she was the Saskatoon Region Coordinator for the Saskatchewan Ladies Curling Association (SLCA). In 1991 she joined the SLCA executive and served as its President in 1992-93. Pat was also part of the Saskatoon bid committee that was awarded the 1991 Scott Tournament of Hearts. She was the Director of Facilities for that event. Pat was also on the officiating crew at the 1989 Brier held in Saskatoon.